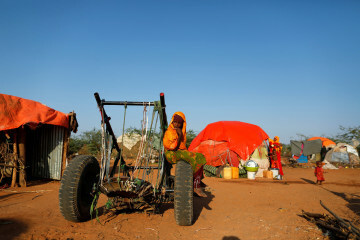 Last year, an older man offered $1,000 for her daughter’s dowry which was enough to take her extended family to Dollow — a Somali town on the Ethiopian border where international aid agencies are handing out food and water to families fleeing a devastating drought. 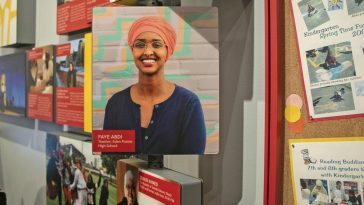 Zeinab initally refused but a month later, faced with her family’s overwhelming need, Zeinab relented. Above: Zeinab, 14, holds her nephew at a camp for people displaced by drought in Dollow, Somalia on April 4, 2017. 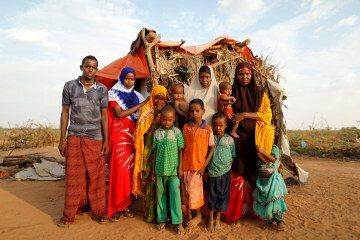 Zeinab, second from left, and her family pose in front of their shelter at the camp. The dowry was received, the marriage celebrated, and the union consummated. 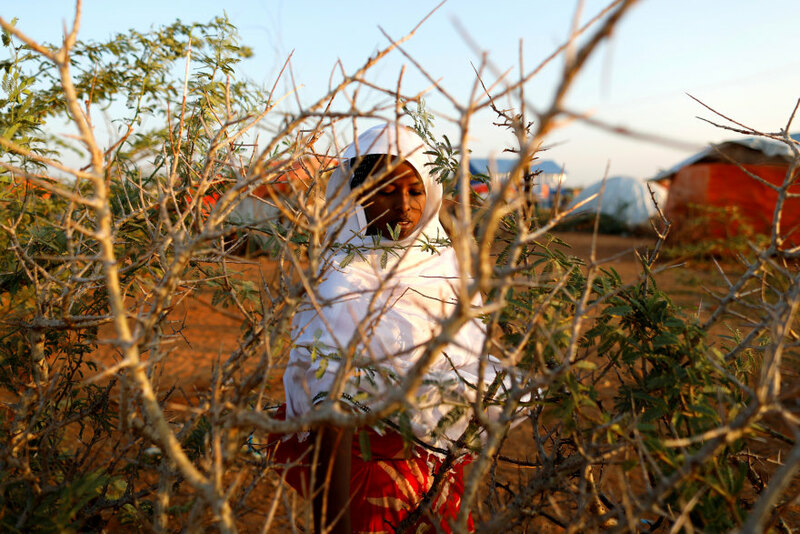 But Zeinab stayed with her husband for just three days before running away and when her family hired cars to drive them the 25 miles to Dollow, Zeinab went with them. But her husband followed, demanding repayment of the dowry. 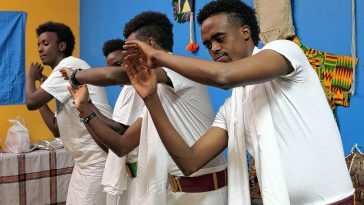 Fortunately the staff of an Italian aid group held a collection and came up with enough cash to repay the dowry and the group are now mediating a meeting between the men of the two families. The husband will get back his money if he divorces her in front of witnesses. 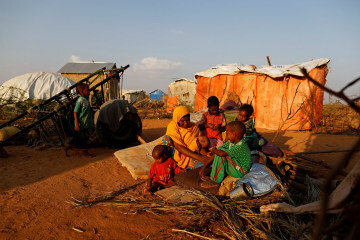 The United Nations says more than half of Somalia’s 12 million population need aid. A similar drought in 2011, exacerbated by years of civil war, sparked a famine which killed 260,000 people. 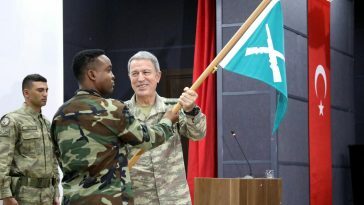 Now the country teeters on the brink again. Zeinab’s sister Habiba, 29, and her children sit beside their shelter at the camp. Zeinab’s sister Farhiya, 6, on a cart. Zeinab washes dishes as her mother Abdir Hussein, 45, gestures and her nephews play. Zeinab stands at the entrance of her classroom at a school for internally displaced children. Stick walls topped by corrugated iron sheets serve as classrooms for 10 teachers and around 500 students. Zeinab attends a class at the school. Zeinab recites verses of the Quran and national songs before class every morning. 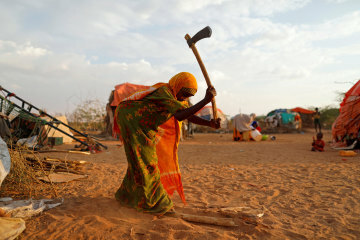 Zeinab’s sister Farhiya, 6, cuts wood with an axe at the camp. Zeinab collects a chewing stick from a tree to brush her teeth. The United Nations says the drought is part of a series of crises which are fueling humanity’s greatest collective disaster since World War Two.